Peeps are a candy that I’ve always associated with Easter, but over the last few years they have been introducing all kinds of different shapes and characters for different holidays. There is never a bad time of year for marshmallows as far as I am concerned, so I always look forward to seeing the seasonal designs. 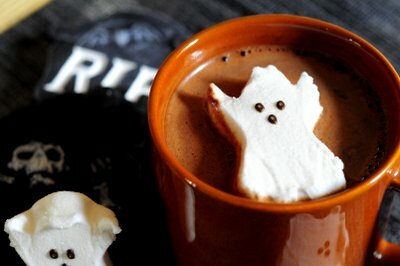 I immediately fell in love with the Ghost Marshmallows that came out for Halloween. They had a great expression and I know that they would be perfect for garnishing spooky dishes – and for satisfying a sweet tooth. I brought home a few packages of marshmallows and whipped up some hot chocolate to put them in. This is a dark chocolate hot chocolate that uses both cocoa powder and dark chocolate for a rich, intense chocolate flavor. The marshmallow will add a little extra sweetness as it melts into the hot chocolate, so just sweeten the hot chocolate to taste as you mix it up. 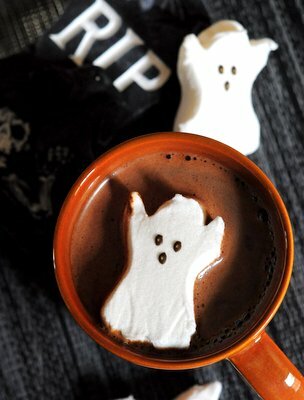 In a large mug (14-oz mug) combine hot milk with cocoa powder, dark chocolate and sugar. Allow mixture to sit for a minute so that the chocolate begins to melt, then stir with a spoon or small whisk until smooth. Add additional sugar to taste, if needed. Top with Peeps Marshmallow Ghosts.